Nothing slows down a process like manual data entry. Keying in data is slow, error-prone and impossible to scale efficiently. For organizations where productivity matters, capturing key data fields off scanned paper, PDFs and other documents must be automated. Intelligent Indexing highlights suggested index terms in the document. Depending on the system‘s level of certainty, they are shown in different colors. DocuWare Intelligent Indexing instantly identifies the most valuable information on a document and converts it into highly structured, usable data. Machine learning technology remembers each document and your indexing corrections, so every capture increases the speed, accuracy and reliability of the tool. After just a few documents, capture is automated and seamless. And because DocuWare Intelligent Indexing is a secure cloud-based service, it takes advantage of “crowd wisdom” to grow faster and more efficient every day. 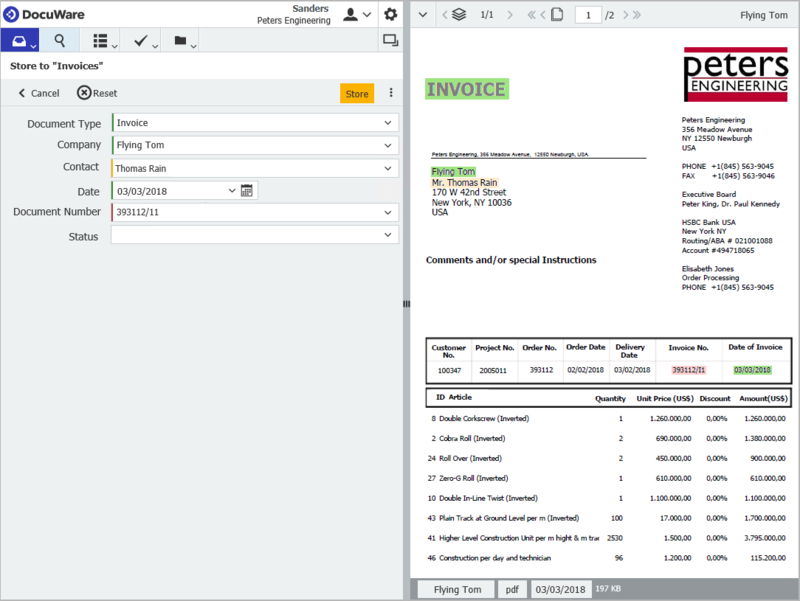 Although invoices, contracts and many documents start their life on paper, DocuWare Intelligent Indexing effortlessly scans for key terms and converts them into structured, indexed data that is usable and searchable. Intelligent Indexing helps companies of all sizes process documents that cannot be standardized – like incoming invoices and delivery slips that look different depending on the supplier. With Intelligent Indexing, tedious and time-consuming labor is eliminated, freeing employees to refocus on far more productive projects. DocuWare Intelligent Indexing is a standard part of every DocuWare Cloud license. DocuWare Cloud also includes Workflow Manager, Forms, and other key modules. If you are using DocuWare as an on-premises system, Intelligent Indexing is available as an add-on module in two configurations: as a web-based service with all the benefits of crowd-sourced machine learning, or as a stand-alone module inside your data center. Our complete solution delivered as SaaS. Cloud, on-premises and hybrid solutions. Apps for the always-on enterprise. Full document security and data privacy. Seamlessly connect your ERP, CRM and other applications.